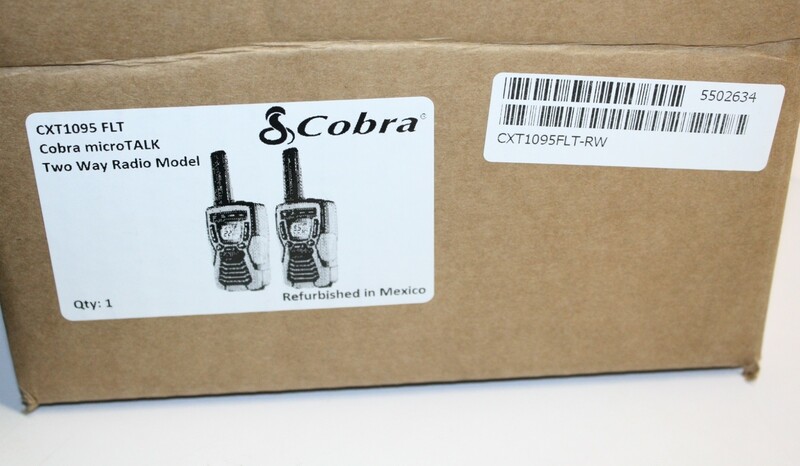 The Cobra Floating Walkie Talkies are the perfect radio for your next hike, camping trip or other outdoor adventure. 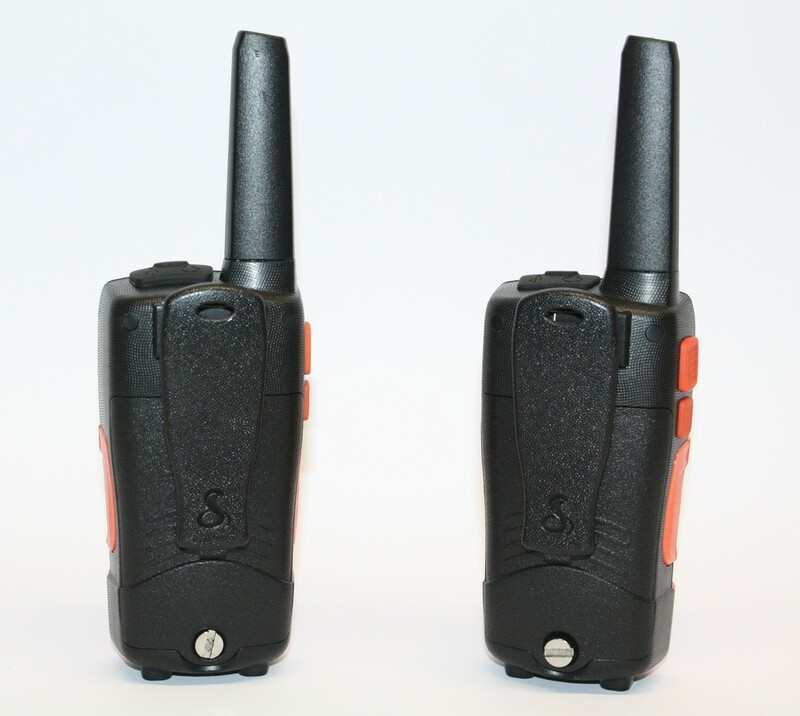 The CXT 1095R FLT two-way radios come pre-charged and ready to use out of the box and have a max performance range of 37 miles. 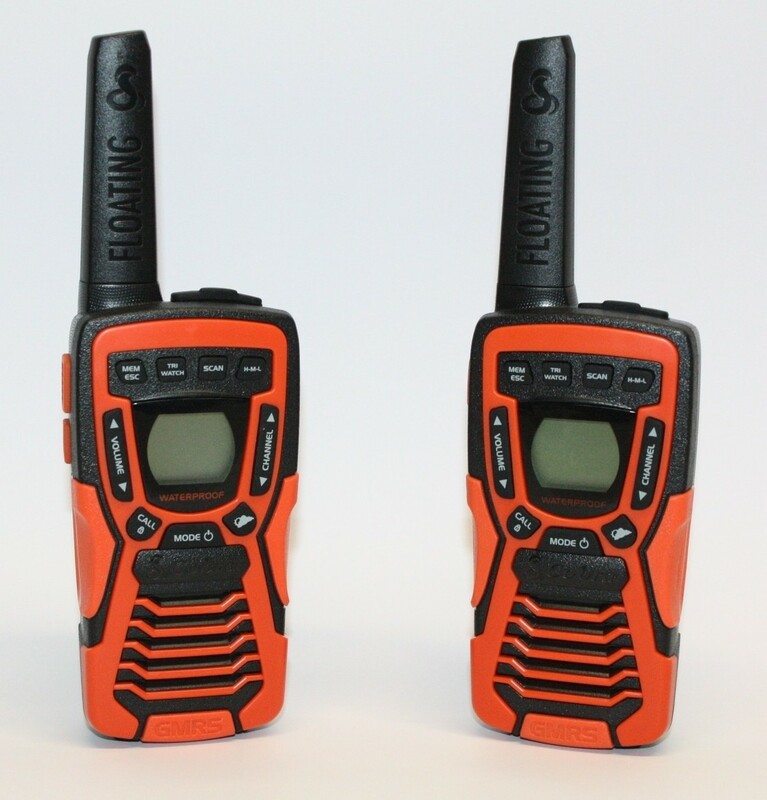 The radios' compact design and rubberized grip make them easy to carry in wet and dusty environments and even if you do drop them in water, their floating and waterproof (IPX7 standard) design make them ready for anything you or mother nature can throw at them. 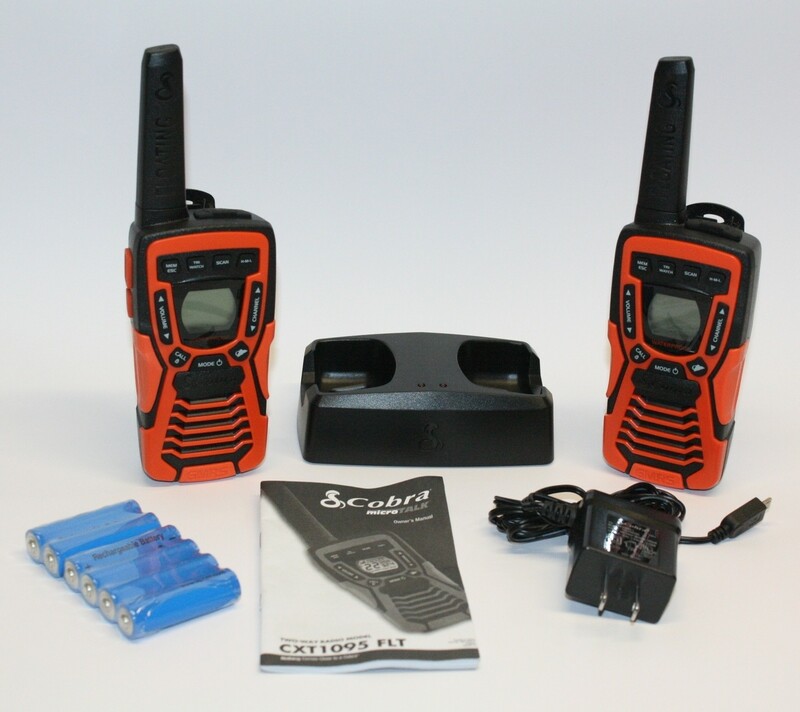 The Cobra CXT 1095R FLT radios also keep you prepared when you're out and about. With a built-in NOAA Weather and Emergency Radio receiver, you will always be prepared for storms and emergencies and get all government-operated weather channel alerts and warnings. These alerts are automatically sent to the radio based on your location, so you don't have to remember to change channels or look for the closest weather stations. · Up to 37-mile range - Provides extended signal range with 2662 channel combinations. · NOAA weather and alert - Be prepared for storms and emergencies with built-in NOAA radio receiver and alert in the event of weather or other emergencies. · Rewind-Say-Again® - Replay missed radio calls. Automatically records the last 20 seconds of incoming audio. · Floating - Never lose your radio. 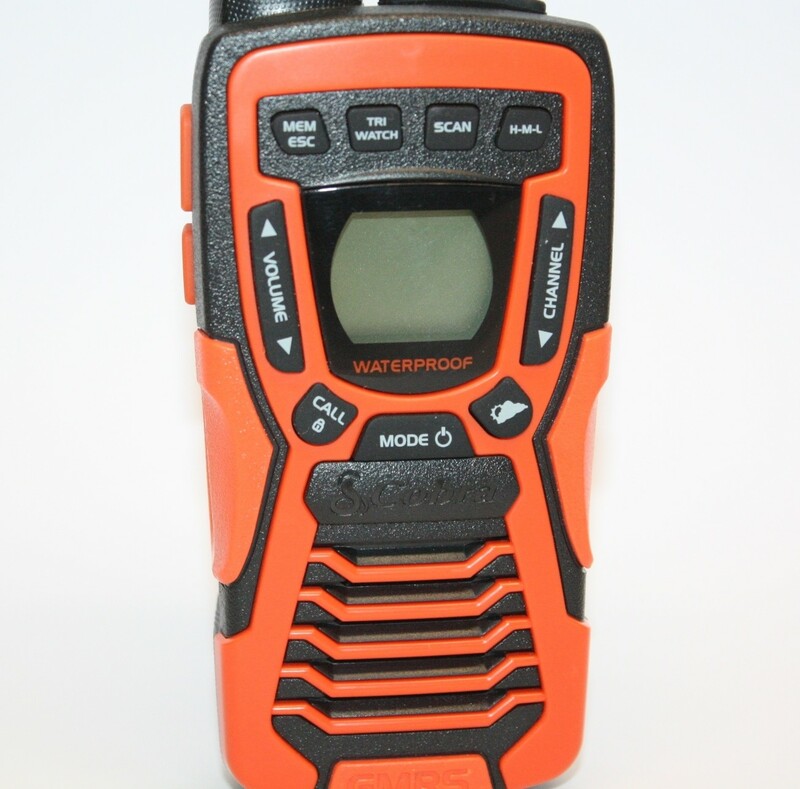 Floating design and orange core make retrieving the radio easy if dropped in water. · VOX - Voice-activated transmission frees hands for other tasks. · VibrAlert - Enhanced vibrating feedback to notify you of incoming transmissions. Replay missed radio calls. Automatically records the last 20 seconds of incoming audio. Never lose your radio. Floating design and orange core make retrieving the radio easy if dropped in water. Be prepared for storms and emergencies with the built-in NOAA radio receiver providing coverage of all government operated weather channels. In the event of a major storm or other weather condition, NOAA broadcasts a 1050 Hz tone that this microTALK® radio can detect and warn you of a weather alert condition. The radio will emit a tone when weather alert signals are received and will automatically switch to the broadcasting weather channel. Meets JIS7 (IPX7) standards; submersible for 30 minutes in one meter deep water. For more assured handling, helps prevent dropping the radio. Handy illumination located on the bottom of the radio cabinet. S.O.S. LED signal capable. The user’s voice is detected and the radio transmits without the need to press any buttons, freeing hands for other tasks. Five VOX sensitivity levels allow the user to select at which point the radio will detect their voice. Enhanced vibrating feedback to notify you of incoming transmissions. Allows the user to scan either channels or privacy codes within a channel to locate conversations in progress. When activated provides key pad security eliminating accidental channel changes. Allows the user to differentiate between up to 10 different parties on incoming calls. Allows use of wall charger or earphone speaker/microphones (not included) for “hands-free” operation. Comes with 6 AA precharged NiMH and ready-to-use rechargeable batteries. Radios can also be used with 3 AA alkaline batteries per radio (not included). Charges supplied rechargeable batteries inside radios directly or through the docking charger. Charges supplied NiMH batteries inside radios. 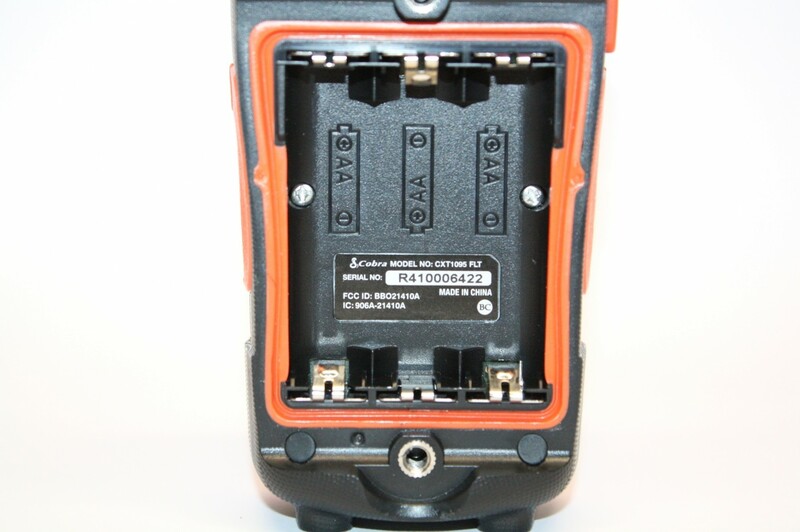 Charger accommodates 1 or 2 radios. 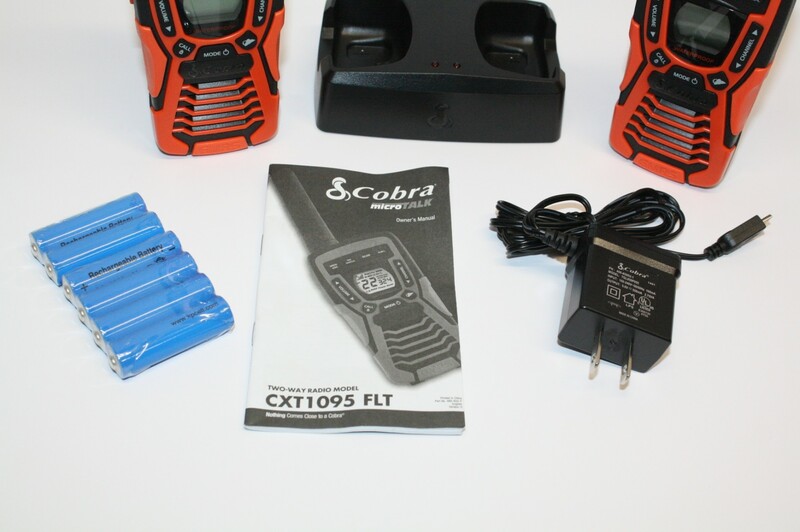 What's in the box: Cobra CXT1095FLT Radio, Belt Clips, Charging Station, Wall Charger.